If you love Thai food, especially authentic Pad Thai, you need this Pad Thai sauce recipe in your life! Made with tamarind paste, palm sugar, fish sauce, and garlic, learning how to make Pad Thai sauce is simple with this homemade, easy Pad Thai sauce recipe. 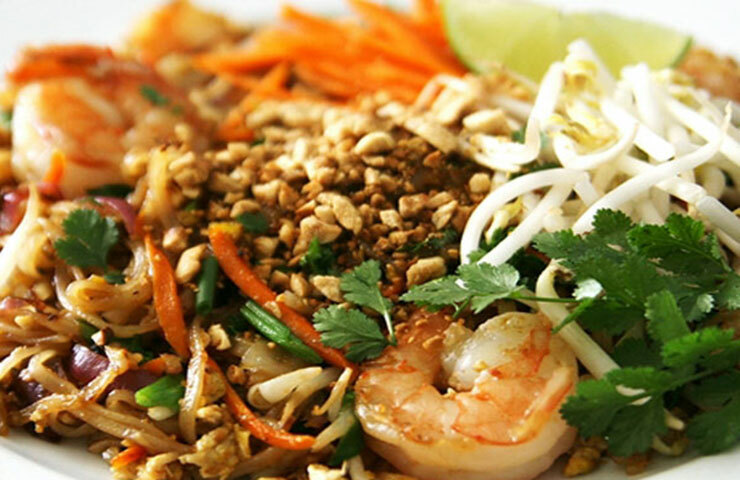 Did you know Pad Thai is one of the world’s most popular foods? A global phenomenon, Pad Thai is comforting street-food made of rice noodles stir-fried in a sour, sweet, savory Pad Thai sauce. It also happens to be one of the most ordered take-out dishes in America. In less time than having to order Thai food and having it delivered, you could easily make this dish at home and it be as good if not better than your local Thai restaurant. I’m serious. To make authentic Pad Thai, you have to understand what this dish essentially is. Pad Thai is a noodle stir-fry. And with most types of stir-fry, each dish is uniquely seasoned depending on the sauce. With so many variations of Pad Thai sauces on the internet, the most authentic Pad Thai sauce recipe has tamarind, palm, sugar, and fish sauce – sometimes pickled radish. Some Pad Thai sauces call for none of these ingredients, which would make it not authentic. If you go through all the trouble to make homemade Pad Thai, shouldn’t your hard work go towards enjoying authentic version? If you see a Pad Thai sauce recipe calling for ketchup, DO NOT MAKE. I beg you. You can call it a noodle stir-fry but you won’t in good conscious be able to call it Pad Thai. 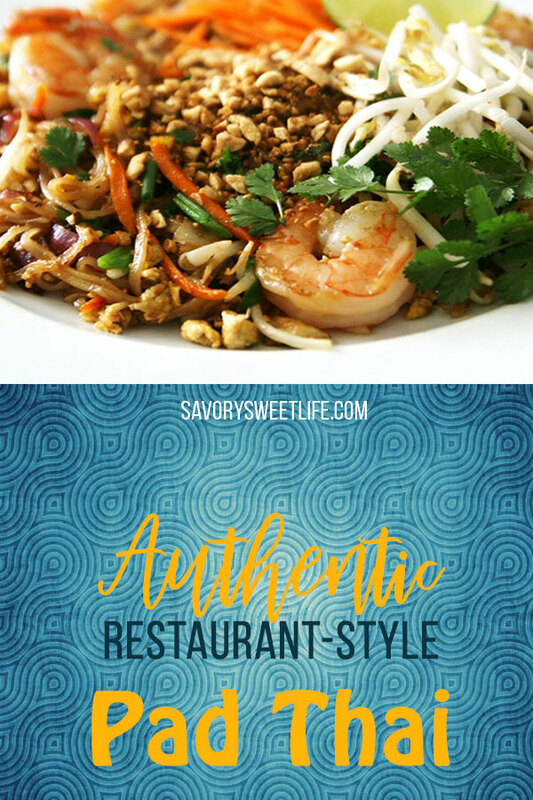 I’m going to walk you through how to make the most amazing restaurant quality Pad Thai by teaching you how to make Pad Thai Sauce – remember, every stir-fry dish depends on how it’s seasoned. Best of all, this sauce is easy. Like, 4-ingredients to heavenly Pad Thai sauce easy. Seriously, if you love Pad Thai, there is no good reason not to make homemade Pad Thai sauce. This recipe is so easy, you’ll be so happy to make this dish at home. Imagine, you, glass of wine, Netflix, and homemade Pad Thai that you made. That is my definition of the perfect night. The Pad Thai sauce flavor is a balance of the recipe ingredients of sour, sweet, and salty – umami. Tamarind is acidic pulp from inside a tree pod (from the pea family) and is a common ingredient in Asian cooking. It adds a pleasant sour flavor to dishes and beverages. Palm Sugar is derived from the sap of various types of palm trees including sugar and coconut. The sap is collected and boiled until all that’s left is a sticky sugar solid and is often spun into disks. 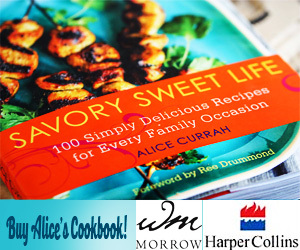 The flavor of palm sugar is very different than refined white and brown sugar. It is noticeably less sweet, deeper and richer in flavor, and is naturally brown in color. Fish Sauce is an intensely flavored sauce made from anchovies, salt and water which has gone through a fermenting process. Its strong, salty, fishy smell adds a layer of umami flavor that enhances Thai food. Without it, Thai dishes are not the same, including Pad Thai. Garlic – Fresh garlic in combination with the other ingredients ties the sour, sweet, salty sauce ingredients together in a way only garlic can and does so well. To make Pad Thai sauce, you cook all the ingredients in a pan until the sugar is dissolved. Once your sauce is ready, you can use it to make Pad Thai by stir-frying rice noodles and fresh ingredients such as tofu, chicken, shrimp, egg, and vegetables. The Pad Thai sauce is added in slowly added in a little bit at a time to give the noodles a chance to absorb the flavor. You should always add the sauce in small amounts until you reach the flavor you’re looking for. To finish off the dish, roasted chopped peanuts are added to the top. Over ten years ago before food blogs were a real thing, I discovered a mother-daughter duo who posted their Thai food family recipes on a site called Joys Thai Food. The site appears to be offline now you can find her authentic Thai Food recipes still on Youtube. Inspired by their authentic Pad Thai sauce recipe, I made an adapted version rivaling the best restaurant versions I had grown to love and were accustomed to. The easiest and best way to make pad Thai is to make the sauce in advance and use as little or much as you need. The recipe makes just over a half a cup of sauce. You can refrigerate it up to a month. If you do refrigerate the sauce and find it hardened, just microwave it for 30 seconds to soften it up. It will be perfectly warm and usable. I hope you enjoy making this Pad Thai Sauce recipe – it is the gift that will keep on giving, satisfying all your Thai food cravings! 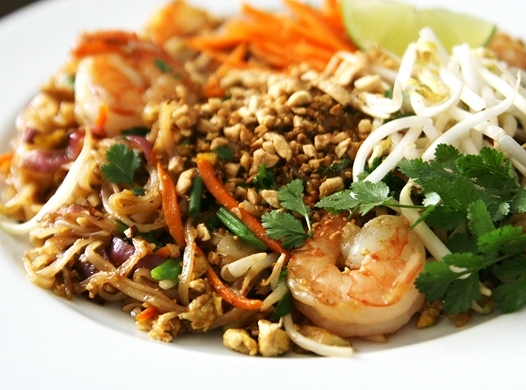 A popular restaurant style Pad Thai noodle stir-fry dish. To make pad Thai sauce, heat a small pan on medium low and add the tamarind concentrate, water, palm sugar, fish sauce, and garlic. 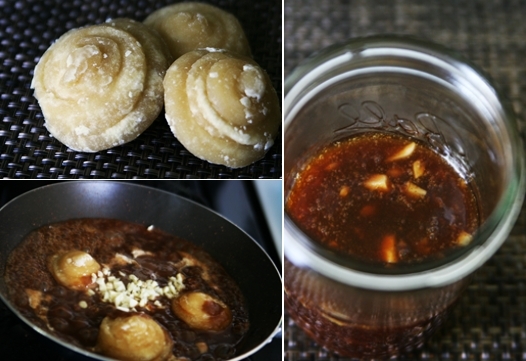 Cook the sauce until the palm sugar has completely dissolved. At this point, you will want to carefully taste the sauce and tweak the sweetness or tangyness by adding a tiny bit more palm sugar or tamarind. Be careful, the sauce will be hot. 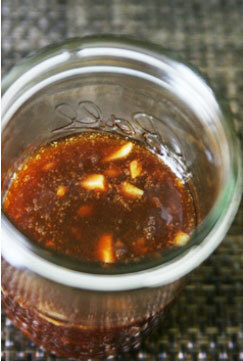 Remove from heat and allow to cool 10 minutes before storing it in a jar or plastic container. Boil the rice noodles on high heat for 2 minutes then drain immediately, rinsing the noodles with cold water for just a few seconds. Noodles should be slightly firmer than al dente. Don’t worry, they will continue to soften and cook later when stir frying. Using kitchen shears, cut the noodle clump in half. This will make it a lot easier to stir-fry and eat. In a wok of large frying pan, heat 2 tablespoons of oil on high heat. Add to the pan the protein and cook for 2 minutes. Remove the protein and transfer to a plate or bowl. Return the pan to heat and add a tablespoon of oil. Allow the oil to heat up and add the onions and stir-fry (stir + fry) for one minute then add the garlic and cook for another minute, making sure to stir often enough so the garlic does not burn. Add the noodles to the pan and drizzle with the remaining 2 tablespoons of oil. Stir fry the noodles for two minutes. This will help the noodles soften a tiny bit more but more importantly will provide enough surface texture for the sauce to adhere to. Add 3-4 tablespoons of the pad Thai sauce continually stirring the noodles until they are coasted with sauce - about a minute. Add the protein back in and fry for an additional 2-3 minutes, adding more sauce if necessary. You don't want to noodles to be "wet." Instead you want to add a little bit at a time allowing the noodles and the other ingredients to soak in the sauce. Move the pad Thai over to one side of the pan. Add the last tablespoon of oil to the bare side then crack an egg over it. Scramble the egg with a wooden spoon and cook for 30 seconds. Add half the sprouts and half the carrots along with the scallions. Mix and stir-fry everything for 1 more minute, frying everything together. Test the firmness of the noodle. If the noodle is too firm, continue to stir-fry for an additional minute adding a spoonful of sauce if necessary. Remove pad Thai from heat and serve and garnish with remaining julienned carrots, spouts, cilantro, toasted peanuts, and a wedge of lime. Enjoy! Cherie: you can sub brown sugar for the palm sugar. There is a comfort to in-home sessions that’s good for the soul. I love this! I’ve made it several times and it keeps getting better as I learn how to taste the sauce. I’m cooking it tomorrow for friends who asked me to please give them more! I have been successful cooking four servings at a time when the noodles are al dente enough at the start. I live in a small town and couldn’t find tamarind juice concentrate. I actually used jarritos tamarind flavored soda! It turned out really well! Possibly that makes it more sweet than some would like though. Boiling has always worked for me too. I’m asian and my family has always done it that way. I made this for the first time this evening as a test before serving it to guests. I noticed the recipe called for tamarind juice and I had paste. I found a sort of conversion in an asian cook book: 1 T paste to 1/2 C water. I used 4 cloves of garlic in the sauce and another 4 cloves in the meal. It worked out very well but I think I’ll add some pepper flakes to the sauce next time. I found the instructions difficult to follow while cooking so I’ve transcribed the recipe to a format I prefer. I think I’ll use the recipe often. This recipe a keeper! The debate of soaking vs. boiling the noodles reminds me of the Italians arguing about putting oil in the water or not! (Definitely not is you want sauce to coat noodles!) I would love a good recipe for Pad Kee Mao and Pad see Ew. Care to share?! I made this delicious dish and wanted to know how to make the color of the dish a little darker. Right now my pad Thai comes out a light color and was wondering what tips you had to make the sauce darker. Thanks! Hello! Ive made this recipe several times and its been so great, thanks! I was wondering, how come this sauce isn’t as orange/red in color? I noticed in other pad Thai dishes from restaurants that they’re a little darker in color. Any tips/advice? I shop at 99 Ranch store. Sometimes they carry different tamarind products such as paste, juice, concentrate, etc. My suggestion to you would be this. 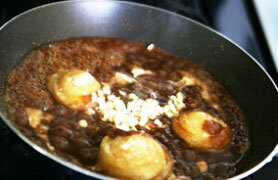 Make the sauce with everything except the tamarind and slowly add it in, tasting as you go. You want the sauce to be tangy with a not-too-sweet taste. It’s hard to tell you how to convert tamarind products – it’s a frustration I have as well when I go to the store and they change products on me. Hope this helps. I am going to have to respectfully disagree with you on this one. 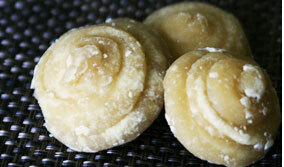 I cook with rice noodles all the time and boil them to a perfect soft/firm texture. I think you could do either or and get the same result. I’m glad to hear soaking works for you though. Quite correct Flower. Rice noodles must be soaked not boiled EVER! Hello! Tried a different pad thai recipe before this and mine also tasted overwhelmingly of tamrind. I used the paste and there is a lot of discrepancies online over how to convert it to juice/water. I also want to make pad thai becusae I am addited to restuarant versions – and I would like to make mine exactly as you have descibed. So, where exactly do you get your “tamarind juice concentrate” and what are its ingredints? Thank you! hi! thanks for sharing. I love pad thai so much! Was wondering if there is any alternative for palm sugar? Im in this area of canada where its hard to find an asian food. although im asian myself. Thank you! My noodle packet says to boil noodles! Never made this so hope it’s ok. I should have ready all your comments before buying ingredients. Also I added the four cloves of garlic to the sauce. Then later it says to cook garlic and red onion. Not sure how much I should have left for the main dish and not added to the sauce! The flavor of the sauce was fantastic. I have tried other recipes but was disappointed in the sauce. I prefer a bit spicier version so added some Thai chile flakes. Also agree with Flower….do NOT boil your noodles. Follow the package directions and soak them. You likely got the Tamarind Paste which is thicker than Tamarind Juice Concentrate and that needs to be diluted. I usually do 2 tablespoons with 1/4-1/2 cup of water for my Pad Thai recipe. I think you got tamarind paste instead of the juice. I made this two nights ago and it was not good at all…I am wondering if I did something wrong because the whole dish tasted like the tamarind. The lady at our local asian market pointed out the tamarind and it was a jelly/liquid like substance. I used the directed amount, but the pad thai was hardly edible. My boyfriend and I eat loads of pad thai and this was a bust. Thoughts?